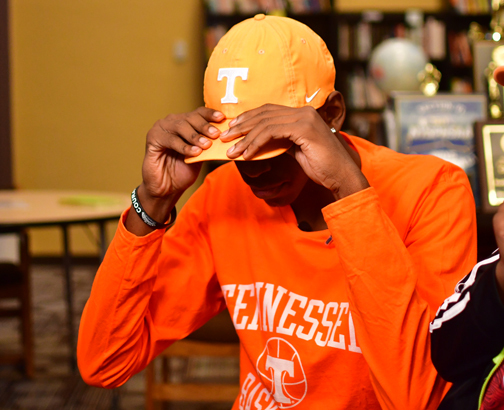 Davonte Gaines signed with UT’s men’s basketball program in November. He plans to enroll this summer. The basketball court had always been a safe space for Davonte Gaines. It was a way to escape the violence and keep him from running with the wrong crowd. Gaines grew up in the Langfield public housing projects in Buffalo, New York, a neighborhood known for crime and drug deals. Gaines watched many of his friends succumb to bad influences. At the age of 14, his two worlds intersected. Gaines was playing pickup basketball at a nearby park with his cousin and some friends when a fight broke out a few feet away. The players stopped to watch and were soon sent scattering by gunfire. One of Gaines’ friends was killed, and others were injured. Gaines had a bullet graze his arm and pierce the skin. Rather than shaking his spirit, the incident inspired Gaines to work even harder at basketball. He was determined to use the sport to get out of the projects, get a college education and build a bright future. The 6-foot-7 wing signed with the Tennessee men’s basketball program in November and will enroll at UT in the summer of 2019. “Seeing some stuff I saw growing up, I just knew that basketball is a way to try and get my family set,” adds Gaines, who was raised by a single mother. 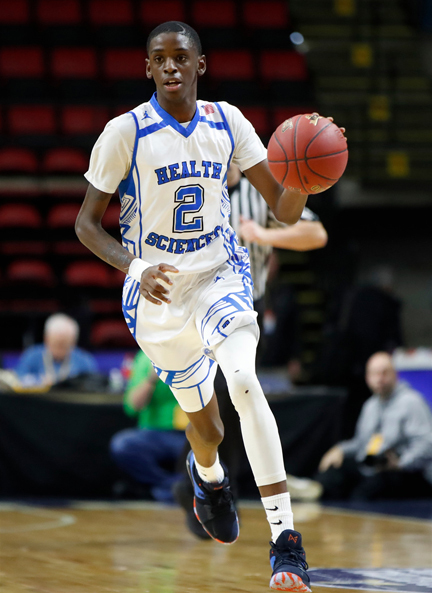 Gaines graduated from Health Sciences Charter School in 2018 and is attending Hargrave Military Academy in Virginia to help him mature and develop more on and off the court. “The transition early was rough for me because it was my first time away from home for a long period of time, and I was not used to anything military like waking up early and formation and everything,” says Gaines, rated as the No. 5 overall prospect in his class in the state of New York by 247Sports. Ty Parker first met Gaines at a middle school basketball game. Gaines had convinced his principal to start a team for his school, and Parker was coaching a local AAU program. Parker watched Gaines play and was impressed by his raw ability. He wanted Parker on his team, and asked to talk to his mother, Denise Leonard, about joining. Little did they all know how influential the relationship would become. Along with being his AAU and high school coach, Parker became a mentor and legally adopted Gaines last year. “His mom was raising four kids by herself, and I was happy to be a male figure in his life and help with his growth and maturation process,” Parker says. “He grew up in an environment where there was nothing but negativity surrounding him. He was blessed with a mindset and willpower to not be caught up in being a follower and using drugs and hanging out on the streets waving guns. Gaines felt an instant connection to Parker and says he has appreciated the support he’s provided over the years to help him pursue his dreams. Tennessee associate head coach Rob Lanier, a Buffalo native, took the lead in recruiting Gaines after hearing about Gaines during a trip back home to attend an event for the local Boys & Girls Club. Gaines wasn’t being recruited by any major Power 5 programs, but Lanier went to watch him work out and invited him to a Tennessee camp. Gaines’ commitment to UT made recruiters and evaluators take a second look to gauge his potential. During his senior season at Health Sciences, he recorded a quadruple-double and triple-double. “A lot of people didn’t think Davonte was good enough to be found by Tennessee because not many kids from Buffalo are playing at the SEC level. It is rare to see kids from there get an opportunity to play in the ACC or SEC,” Parker says. After the shooting that killed his friend, Gaines was hesitant about leaving the house and stopped going to the park for many years. He found other basketball courts that made him feel more secure. Gaines’ family was able to move out of the projects two years ago and settle in a different area of the city. Being able to attend Tennessee will open a new world to Gaines and give him a chance to give back to his mom. “My whole life that has been a motivation for me,” Gaines says. “Her situation was never the greatest. I don’t look at it as a handicap though, just motivation for me to provide for my family and get them out of the situation we are in.